So what can you do with pickled carrots and daikon? Create lotus root salad (goi ngo sen), a simple, yet refreshing Vietnamese salad with a big crunch. We had a huge mother’s day feast this weekend and since it was hot and sunny here in Southern California, this salad was perfect for the barbeque. Stay tuned for what else we made. As a teaser…nem nuong kimchi sliders, strawberry mojitos, grilled lemongrass shrimp skewers, grilled lobster tails and grilled corn on the cobb, Cuban/Mexican style! This dish is comprised of crunchy pickled lotus roots, pickled carrots and daikon, tender pork and shrimp, and dressed with fish sauce vinaigrette (nuoc mam pha), crispy fried shallots and roasted peanuts. So light, refreshing, and so easy to prepare. Rinse out the pickled lotus roots. Cut the lotus roots in half shortwise, diagnally in bite size pieces. Coarsely chop the fresh coriander and mints. Now with the pork and shrimp cooled, slice the pork thinly. Peel the shrimp and slice the shrimp in half lengthwise deveining at the same time. 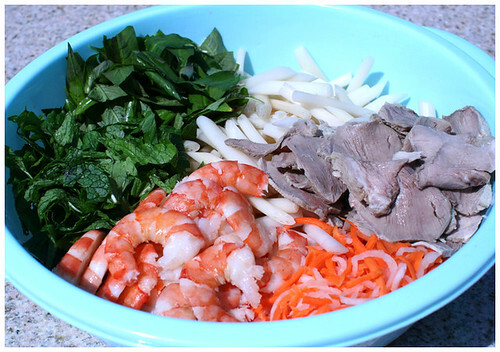 In a large bowl, mix together the drained pickled carrots and daikon, lotus roots, mint, coriander, sliced pork, and nouc mam cham. Top the the salad with shrimp, roasted peanuts, and fried shallots. Enjoy this simple, deliciously crunchy Vietnamese lotus root salad. Happy mother’s day to our mom’s and every mother! Looking good. Welcome to the world of blogging! Looks great! I have never had pickled lotus roots before. Does it taste just like the pickled carrot/daikon mixture? Can I pickle the lotus roots the same was as the carrot/daikon instead of buying the jars of it, or does it have a different taste? I’m so anxious to try this recipe!!! Wandering Chopsticks–Thanks!! We’re having fun doing it. BeaAcooker–you know, I have never seen fresh lotus roots. If you do, I think you can pickle it the same way as the carrots and daikon. The beautiful thing about lotus roots is that they soak up the flavors of the nuoc mam but still stay crunchy for days. The jars are pretty cheap and found in most Asian groceries. Thanks for reading our new blog!! 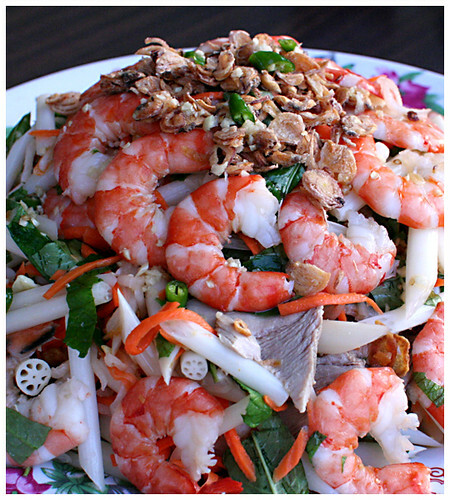 One of my favorite Vietnamese salads – I love the crunch and sweet/tarty flavor of the nuoc mam. Yum! nutitiontokitchen–thanks! you have a great blog too–love the nutrition info–esp about trans fat! Hope to have you as a reader. my friend's mom puts some kind of fish jelly in hers instead of pork though. I dont know what the fish jelly is though…i'm totally trying out your recipe!!! factory junkie: yes, the fish jelly..we're not too fond of those but whatever works. let us know how it goes! I'm thinking of making this, but I was wondering if you used a different kind of coriander, as here in the U.K, our coriander looks somewhat different than the stuff pictured? Nii: We use Vietnamese coriander which is also called malyasia as laksa, pak pai in thailand. While the flavor is enhanced with this herb, it's not completely essential. 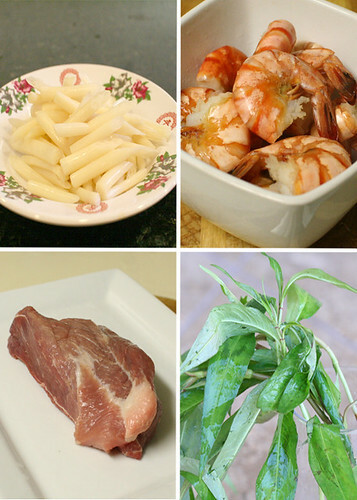 You can even substitute thai basil since that is probably easier to find. do you make your own pickled carrots and daikkon? or do you buy it jarred? Kim: We definitely always keep some home madepickled carrots and daikon in the fridge. It's really easy to do! Hi there! I can't get pickled lotus root where I live (small German town). Is it possible to use dried lotus root in the recipe? Tavy: we never used it before and if you reconstitute it, we're not sure if it provides the same type of crunch..try just using cucumbers and celery. We just sprinkle salt over it and then after 15 minutes, rinse the veggies and squeeze out the juice. it's a great substitute. I discovered your blog recently and love it! I am Vietnamese but we do not eat Vietnamese food regularly at our house since my husband is Caucasian and prefers his "meat & potatoes" meals. 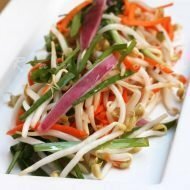 I tried this recipe for our daughter's birthday party and it was a big hit among Asians and Non-Asians. Instead of pork, I used the roasted chicken from Costco and shredded it. I also used the lime and cilantro marinated shrimp from Costco also to save myself some time. Thanks so much for posting all your recipes. I'm seeing lots of recipes that my mom used to make when we were growing up. Unfortunately, I did not take good notes and she has passed on so you guys are providing a great service to me. Please continue to post the "home cooking" type recipes. I love them all. I was looking for “canh bun recipe” via google and stumbled on your blog. I enjoy the colorful pictures and all the easy-to-made yet so delicious Vietnamese recipes! I will definitely try them all over the next months to come. I cook vnese food 2 to 3 times a week and sometimes… i don’t know what to make! Your blog will come to my rescue when that happens again in the future. I will try your canh bun recipe and see how it goes. Thanks for all the wonderful recipes! 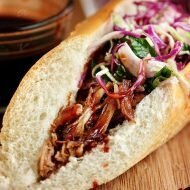 How long do you recommend boiling the pork shoulder for? Is there a particular brand of jarred pickled lotus root that you recommend? 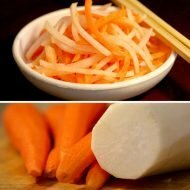 if you don’t have pickled carrots or daikon, can you just use regualr shredded carrots and daikon? How do you make pickled carrots and daikon? the recipe is on our blog…vinegar, sugar, and salt! Also can you make this dish in advance like a day or two? I was hoping you could say how many people you would expect this salad to serve?